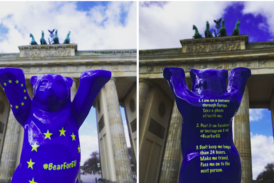 On all 5 continents The United Buddy Bears promote tolerance, peace & freedom on their global tour. Here, videos from all over the world tell the story of Buddy Bear activities and United Buddy Bear exhibitions. Have a look at the latest videos, showing the exhibition in Havanna, Santiago de Chile and Riga. Buddy Bears have travelled the world to delight people with their presence. As cheerful ambassadors for Berlin, they are - on company premises, in front of embassies etc. (overview map Berlin). Buddy Bears are available in different sizes and designs. About 2.3 million € have so far been raised for children in need. Should you have a serious interest in one of the next auctions, send us an e-mail to auction(at)buddy-bear.com. Here, videos from all over the world tell the story of Buddy Bear activities and United Buddy Bear exhibitions. Have a look at some videos, showing the exhibition in Havanna, Santiago de Chile and Riga.